Applications like QuickBooks, AutoCAD, Microsoft Office, SolidWorks, Photoshop, and 3-D games are all critical for certain groups of our users. Many of us rely on them every single day. Each application has its own system requirements and from time to time, the settings have to be changed in order for it to run effectively in a virtual machine. How cool would it be to tune these settings in just a few clicks to optimize Parallels Desktop? Good news! 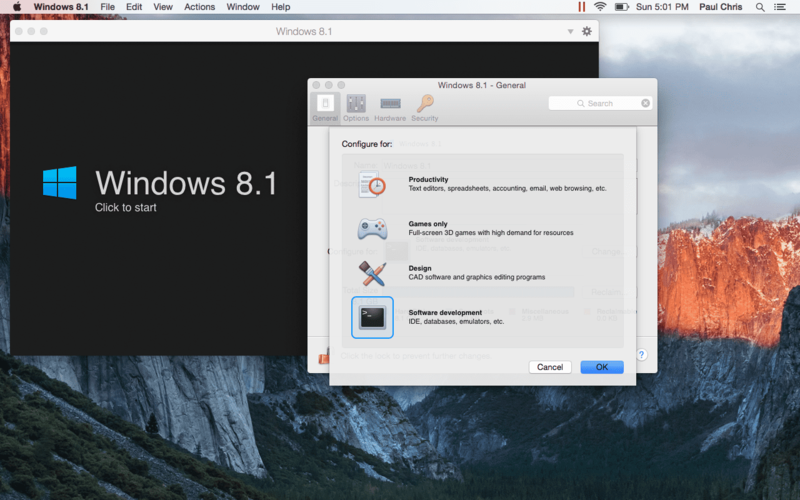 This feature is available in Parallels Desktop. 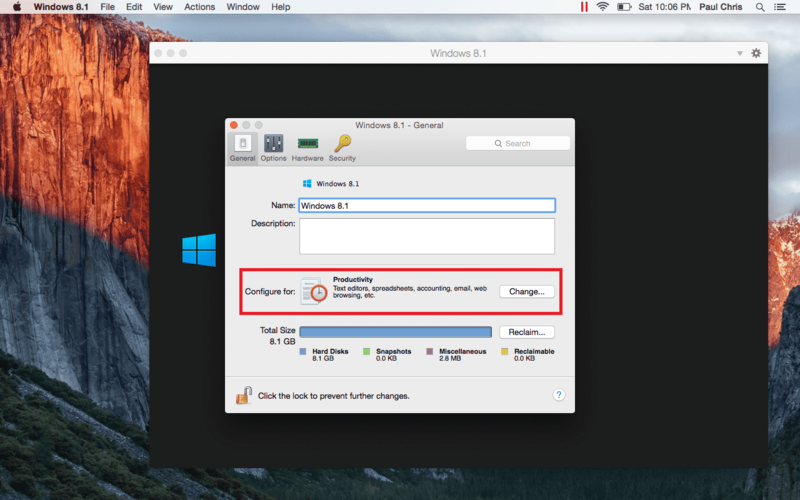 Let me explain the differences between the four VM profile options included in Parallels Desktop. When you install Windows in a VM, you’re prompted to select the primary use type for your Windows VM: productivity, games, design, or software development. Let me go over each profile in more detail. The Productivity profile is designed to meet the needs of Parallels Desktop users who use Windows mainly for office work, surfing the web, watching movies, working with basic Windows applications like MS Office and QuickBooks, and other similar activities. When you choose the Productivity profile, the VM will have two virtual CPUs and 1 GB of memory assigned to it, which is optimal for Microsoft Office 2015 and most office applications. In addition, all of the integration features like Shared Folders and the Shared Profile will be enabled, and the default startup view will be Coherence. When the Games Only profile is selected, the VM will have the maximum recommended memory (the green zone of the Memory slider under Configure → Hardware → CPU & Memory) and 512 MB of video memory. Sharing Profile will be disabled, but your mouse and keyboard will be optimized for games. The startup view will be set to Full Screen. The Design profile is intended to meet the needs of Parallels Desktop users who use Windows mainly for running applications such as CorelDraw, Photoshop, or 3-D modeling software. When you choose the Design profile, your VM will have the maximum recommended memory and 512 MB of video memory to provide the best video/graphic performance. At the same time, most of the integration features will be enabled, allowing you to save your projects directly on the Mac side. The startup view will be set to Full Screen. The Software Development profile is designed for Parallels Desktop users who use Windows mainly for developing desktop and mobile apps, web development, and software or network testing. The Software Development profile provides the VM with the maximum recommended CPU and memory. It also enables nested and PMU virtualization. Shared Profile will be enabled; however, Shared Applications will be off by default. The startup view will be Window. Start your VM to make sure the new settings were applied successfully. If you believe that none of the four preset profiles fully meets your needs, or you just want to experiment with your VM’s settings, you can also adjust your VM manually. Simply go through the configuration window and make the necessary changes. To learn more about manual fine-tuning, please refer to this KB article. To revert any configuration option to its default setting, click the Restore Defaults button at the bottom right side of the configuration window. I hope this blog helped you save some time and avoid manual VM tuning to fit your needs. Thanks and don’t forget to follow us on Twitter!